The Sequence Total is a versatile and compact automatic self-adhesive labelling machine suitable for almost any style of flat sided glass, plastic or metal containers. Ideal for label application to front and back using adjustable height top drive conveyor to control the product during labelling process, the Sequence easily handles product heights from 30mm to 300mm high. Designed to standalone or work in line, this labeller is simple to set up and has a wipe clean touch screen control panel with no language operation. 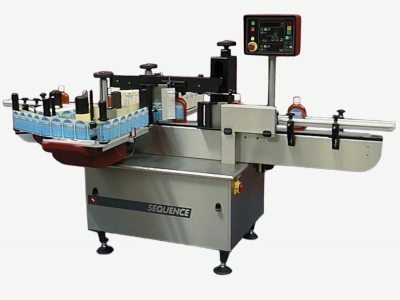 The Sequence can be supplied with additional features such as wraparound unit for round product labelling and thermal printer option for batch and date coding. For full list of features, download our brochure.